We make life difficult for ourselves with every sinful choice we make, but sometimes what we need to hear is that our sins have been paid for, and that the hard service that we had to serve has been completed. This was the case with God’s people in Isaiah 40. The first 39 chapters of Isaiah are the prophet confront the people with their sin. One of the chapters where this is most obvious is chapter 5. In verses 20-21, we read about how the people are exchanging sweet water for bitter water, trading light for darkness, and calling evil good. The people of God have clearly made their bed, and it would seem based on what we read in Isaiah 5:25-30, they’re going to have to lay in it. Here we have an imagery of God sending a call for pagan nations to come and swoop down like a pack of wild animals on his people as punishment for their sin. We see this fulfilled when Assyria comes in and attacks the people. God eventually brings judgement on Assyria for this attack, even Israel brought it on themselves (Isaiah 10). For those first 39 chapters in Isaiah, we see God heaping on Israel woe, wrath, and judgement, but then in chapter 40 something happens. It’s all over. God declares that their hard time is over, and their sins are forgiven. We can be stubborn and rebellious like the children of Israel. 1st Corinthians 10 shows us that we can be partakers of the covenant, and yet God can still not be pleased with us. However, unlike the children of Israel, someone has already taken our wrath and judgement for us – Jesus Christ. What we should see in Isaiah 40 are comforting words that should encourage us to leave behind our sin and run to Jesus. When He says it is finished, He means it. 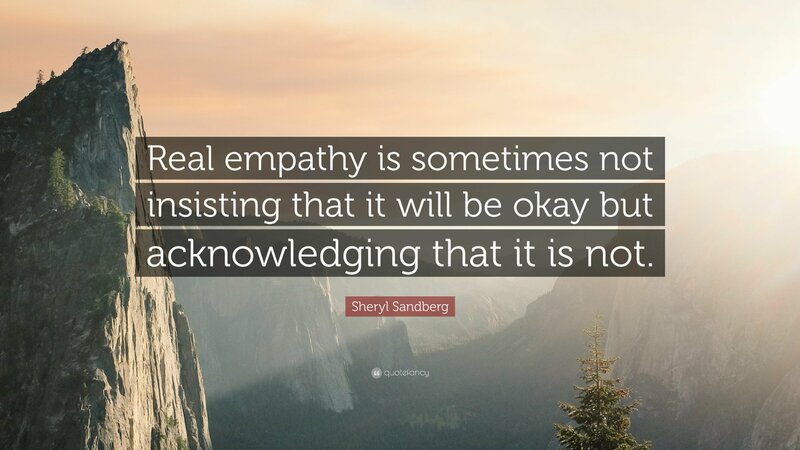 Telling someone who is suffering to “Buck up!” or “Be strong!” shuts down conversation by shaming the person, instead of providing a safe place for healthy dialogue and compassionate understanding. It says that you are not willing to try to understand the other person’s situation, that you’re not willing to walk with them through this trial. It overestimates the power of the human will and emotions. It assumes that if only the person tried harder or thought more positively, things would be better. It assumes that the problem is with the person’s effort or attitude. This ends up isolating the sufferer from resources and people that may be necessary for their situation. It guilts people about things which are largely not under their control, instead of freeing them with knowledge that some things are not their fault, while providing a safe and empowering environment in which to make choices over those things that they can manage. It downplays or denies the reality of the difficult parts of the human experience and the validity of unpleasant emotions. This means, of course, that such persons will be of little or no help in actually dealing with such experiences. Basically, telling someone to “be strong” or “buck up” shuts down conversation and relationship, isolates the sufferer, guilts and shames over that which is out of the person’s control, may prevent the sufferer from getting the help they need, and denies the reality of the full human experience. Has your heart ever been troubled? Have you lost sleep over worry and stress? Has your entire being ever ached over an insurmountable problem that didn’t seem to have a solution? I think we all have at one time or another. What do we do in these times?I’ve often found that in these circumstances I’ve got no choice but to pray and wait for God to act. I like being in control. I like being able to make life decisions for myself, but when I feel I’m backed into a corner I begin let my heart get troubled. I go over possible scenarios in my head of how the situation could work not knowing what could possibly happen and I just add to my worry and stress. What’s going on inside when I allow my heart to become troubled in spite of Christ plainly telling me not to allow my heart to be troubled? I’m giving in to my worry and stress and I’m ultimately looking to myself for answers instead of God. Let me just tell you something that I’m having to remind myself every day for the last year – God will provide. You see, when you’re in the dark and it looks like you’ll never see the light again, that’s when Jesus comes into the dark and whispers peace. Jesus is the light of the world (John 8:12), but he’s also the light of our world. He exposes those things that the darkness tries to hide. He covers us with his wings, and He feeds us with sweet manna from heaven. That may not be comforting when the bills are due in three days and you have no idea what you’re going to do, and you’ve got nothing but Ramen in the cabinets, but God will provide. Jesus is after your joy. Think about that. He always wants us to have joy. But, how can we take joy in being pruned? Hoe can we take joy in knowing that we must always depend on Him? As human beings, we are so independently minded that we often forget that we need Jesus just to breathe. We have a hope beyond this meager human experience, let’s pursue that hope together!